In the build up to the Women’s Literature Festival in Bristol on the 16-17 March, BookElf will be reviewing the work of the writers on the Womens Writing Today panel. The event will look at the issues facing women writers today, and their inspirations for their work. I had never read any Stella Duffy, despite her being a prolific writer of Stuff I Like, before being heavily recommended Theodora by @sianushka a couple of years ago. I promptly went out and borrowed it from Leeds Library, as I did with this book, and fell in love with her. The Purple Shroud tells the second half of the story of Theodora, who started life as a prostituted child and circus performer, became a religious convert and finally Empress of the Byzantine empire, part of the August couple made of herself and Emperor Justinian. They lived in Constantinople around 500AD and she is seen as one of the most important women in the history of the Roman empire. 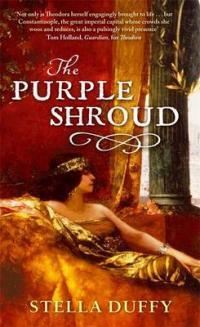 The first book, Theodora, was wonderfully written and captured brilliant a sense of place and time. What Duffy does so well is to show a city and way of life very different from our own, but make her characters real people who just happen to live 1500 years ago, as opposed to some historical fiction which creates flat stereotypes of kings and queens and courtiers. Although parts of Theodora dragged, her epic religious conversion in the desert especially (though it is quite hard to write about someone sitting in a cave doing nothing but pray for weeks on end and make it sound slightly interesting…) the character of Theodora herself, passionate and prone to acting before thinking, was a delight. In The Purple Shroud, Theodora has grown up. She has power and status, and is not about to lose. them. I liked her less in this book, she is cruel and vindictive and jealous and spiteful, but she is also wild and fun and very very bold and you can’t help but admire her. Her relationship with Justinian was something I especially enjoyed seeing evolve. The city is more the focus of The Purple Shroud, she isn’t wandering around the desert any more and the book is all the better for that. Seeing events such as the Nika riots between the various factions against the Emperor destroy the city Duffy managed to capture Theodora’s sens of loss, not just at the buildings and the dead, but of her trust for the people, perfectly. This book reminded me a lot of I Claudius by Robert Graves, and would make a cracking TV series, just like I Claudius did in the 70s. If you like your historical fiction to be less soppy heaving bosoms and a bit more bite, this is for you. So that’s it! All the writers on the panel I’ve now read and reviewed. I am ridiculously excited about next week, three whole days of books and feminism and lovely lovely women. If you fancy a jaunt, why not join me? Bristol is a fantastic city and well worth a visit. The festival is on for two days and includes a variety of events. See you there? !